In the eighth and ninth chapters of The Crest of the Peacock, George Gheverghese Joseph turns his attention to the mathematical history of India. Is it possible to prove that a culture was numerate without seeing their numbers? Such is the case (and question) with the Harappan civilization, which occupied the Indus Valley of modern Pakistan from 3000 to 1500 B.C. Because the Harappan script remains undeciphered, it’s impossible to know what represents a number and what might be a letter or word, or even whether the symbols represent a written language at all. So are there clues of their numeracy? Cubic stones of uniform size and weight which were in use across hundreds of years. Taking one stone of 27.584 grams as a standard, the remaining stones form a series with the sizes 0.05, 0.1, 0.2, 0.5, 2, 5, 10, 20, 50, 100, 200, and 500. These stones might have been used as the weights of a scale. Shells and other materials which were marked with consistent gradations. These may have been used to measure length, like a ruler. 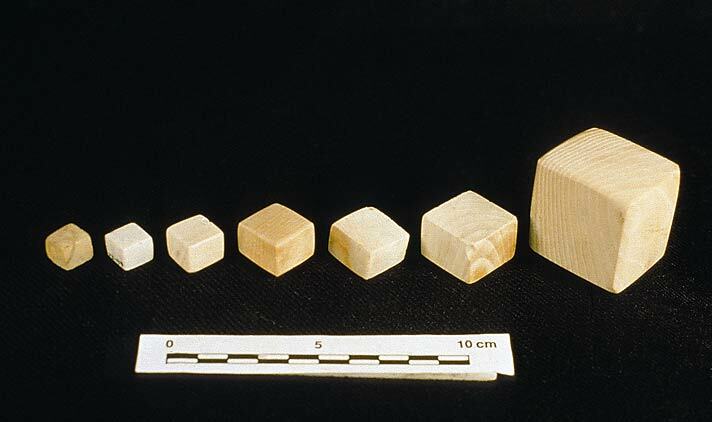 Cubic weights made from chert discovered in what is now Pakistan. Photo courtesy Harappa.com. Perhaps the findings above, which were unearthed as part of archeological investigations, are simply the product of coincidence. Then again, these units of measurement have been found throughout the former Harappan territory, which stretched hundreds of miles, and across 500 years of their civilization. It seems plausible that these measurement devices are the remnants of a standardized system of weight and measure, which would have been dependent on a numerate society. The Vedic period, which spanned approximately 1500 to 500 B.C., followed that of the Harappan civilization. The Vedic religion is now seen as a precursor to Hinduism, or as an ancient part of the Hindu religion itself. Ritual played an important part in the religion, particularly the fire worship, or Agnicayana ritual. The preparation for this ritual involved the creation of sacrificial altars with specific shape and dimension which were said to please their gods. The prescriptions for altar construction, which come from the Sulbasutra texts, also show early knowledge (though no formal proof) of the Pythagorean theorem, Pythagorean triples (right triangles whose sides all have integer lengths), and of approximating square roots to a high degree of precision. For example, they were able to approximate √2 to five decimal places. As I’ve discussed in previous posts, these entities have existed individually at different points in history in different parts of the world. The Mayans, for example, used a positional system with zero, but used base 20 instead of base 10. The Egyptians, on the other hand, had a symbol for zero but did not use it in a positional sense. None of this to say that these three entities are required or ideal. After all, you could literally build the pyramids without having all three. The earliest record we have of a positional, decimal system which employed zeros as a place value likely comes from the Bakshali manuscript, which was found in present-day Pakistan. Some parts of the manuscript date to the third century while others date to the tenth, leading historians to believe that the manuscript was assembled over a long period of time. Numbers which appear similar to those found in the Bakshali manuscript have been found as far east as Sumatra and present-day Vietnam. They date to the same period as the manuscript, at which time these regions were under the culture influence of India. Aryabhata, the Indian mathematician born in the fifth century, employed a positional number system in his works. And while he did not use a symbol for zero, some have argued that his awareness of the properties of the number can be inferred from his work. If you’re curious about how this ends up as a math problem, well, you’ll just have to use your imagination.